During our visit to Madrid, we stayed at the house of our friends Miguel and Yaire, located in the outside of the city. 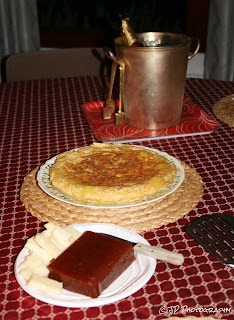 One of the nights, our hosts prepared a delicious yet simple dinner that can me transformed easily into a Spaniard brunch. For starters, Yaire mixed little pieces of jamón ibérico with cheese (any spreadable cheese like cream cheese) and filled mushroom caps (crimini can work here) and baked them in the oven for a few minutes. While we waited, Miguel poured a few glasses of Cava, a type of champagne made in Spain, and started working on his Tortilla Española. He began by cutting the potatoes in different bite sizes not finely sliced at all. He tossed them in a hot pan with extra virgin oil covering them and frying them until golden. Then he drained the oil reserving a little bit of oil in the pan with the fries and poured 5 - 6 gently beaten eggs. When the eggs were about done, he carefully flipped the tortilla in a large plate and then slide the tortilla back into the pan to keep cooking on the other side. The final result was a fluffy and delicious tortilla that he later sprinkled with a little bit of parsley and paprika. To finish our dinner, Yaire cut thick pieces of membrillo (similar to guava paste but a thousand times better) and served them with chunks of soft aged Manchego cheese. A great combination!!! All ingredients can easily be found at specialty stores like Whole Food, Fresh Markets or the international sections of popular supermarkets.